Extremely beautiful and rare dining group set by Rudi Bonzanini, 1962, Italy. Group consisting of five chairs and a round table. Stunning design by Rudi Bonzanini, produced by Tecnosalotto in Mantova, Italy. The chairs and table's base are made of fiberglass and lacquered white. The tabletop is made of marble. Signed and stamped underneath. This wonderful set is coming from a private collection in Paris, France. Measures: Chair 47 x 42 x 74/44.5 cm [D x W x H/SH] Table 110 x 74 cm [Ø x H]. 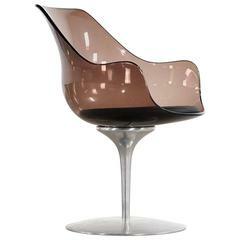 Erwine and Estelle Laverne Champagne chair by Formes Nouvelles, circa 1962. Lucite, aluminium and black sky pillow. Very good condition!